I’m pleased to announce that the winner of Tansy beetle bag giveaway is Julie b. Congratulations, the tansy beetle bag will be winging it’s way to you. Thanks to everyone who entered it was great to see so much interest. I also have good news about the Tansy beetle I saw another one very near my house on a green, which is an area of special scientific interest. I haven’t seen them there before so I think it’s a good sign. 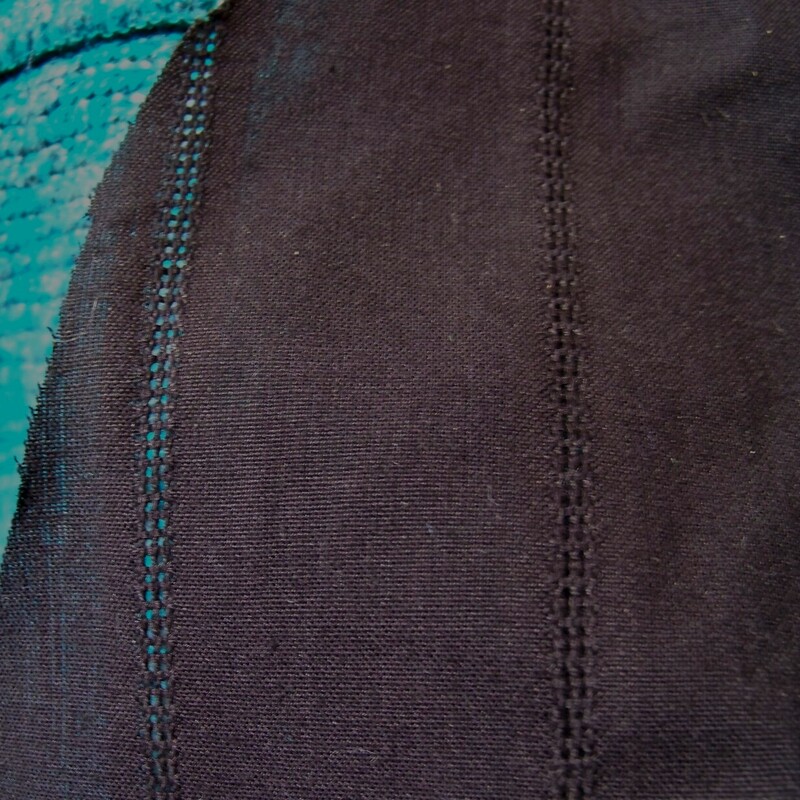 I’ve been working on a new design for a woman’s top using fabric with a woven pattern. It’s organic cotton woven on a hand loom in India and has stripes of openwork, little holes like lace, it’s very pretty and quite fine. I’m trying a different shape for the top that flows out at the bottom but sewn so it still hangs flat. If it works I’m hoping it will show the shape when you move in it. I also had a couple of ideas for decoration around the neckline and bottom but the design on the fabric may be enough as I don’t want to make it look too fussy. I’ve also got some plans to make the arms longer so that the fabric covers the cuffs, I’m hoping this will make it look really special. I had the second fitting for the shirt I’m making yesterday which went well, although some adjustments were needed. The green check fabric is really nice to work with and hangs well. I’ve started sewing some of the main seams even though I still haven’t finalised the exact look of the collar. After reviewing the look of the shirt I have decided to created visible turn up seams on the bottom of the shirt to match the sleeves. I think this will add some volume to the shirt and creates an extra detail to balance out the decorative buttons. I also like the style it gives to the shirt, the turn ups on the sleeve remind me of the 50/60s and shirt sleeves being folded to keep cigarette packets in. I’m hoping to get the hemming done today as I’m looking forward to relaxing for Easter. I’ve taken the beetle fabric I printed yesterday and created an envelope bag which I’m giving away to celebrate Earth Day on the 22nd April. I’ll put the details about how to enter at the end of this post. Yesterday I wrote about creating the fabric print that’s featured on the bag and I’d like to tell you a bit more about the beetle that inspired the design. 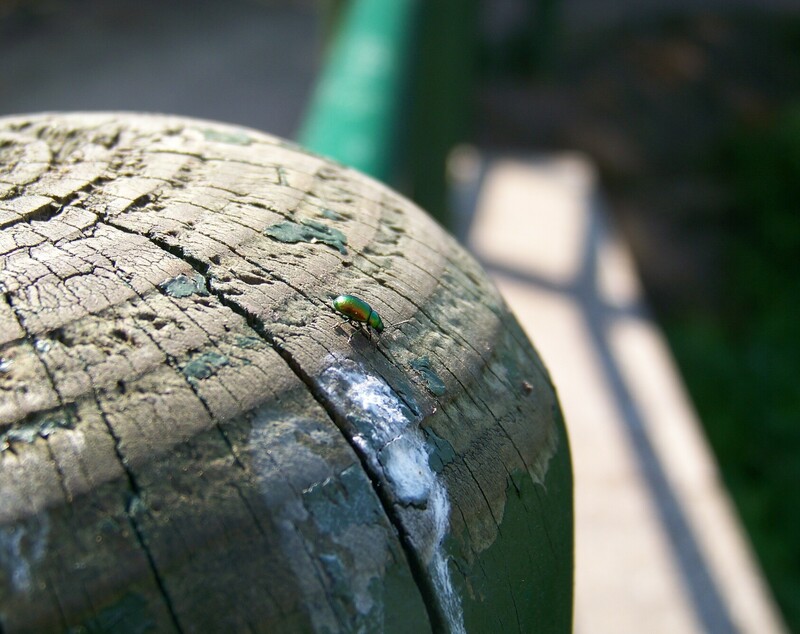 I first saw the iridescent green beetle by the River Ouse a few years ago. I took a couple of photos but didn’t think much of the bug until some time later when I decided to find out what it was. That’s when I found out about the Tansy beetle. The beetle is endangered and extremely rare in the United Kingdom, and it’s shell is so shiny that people say the Victorians used it as sequins. It is an endangered species and in decline due to environment changes that effect it’s ecosystem. It is so scarce that the only place in the UK it is known to survive is along some of the River Ouse centered on the stretch that runs by my home in York. So, this weekend when I was walking by the river and saw a Tansy beetle shining green and gold I was very glad that these beetles were still hanging on. This tenacious Tansy inspired me to create the design as a celebration of its survival. I thought using some of my organic fair trade cotton to create a giveaway for Earth day would be cool and a reminder to everyone about the reaches of the environment just outside our doors as well as across the whole planet. The bag that I’m giving away is made from organic fair trade cotton and is printed with water based ink. 27 cm by 20 cm. The material is called santeen unbleached and was undyed until I added the pattern. It’s fastened with velcro at the top and although the fabric is sturdy it is probably best not to put anything too heavy in it. 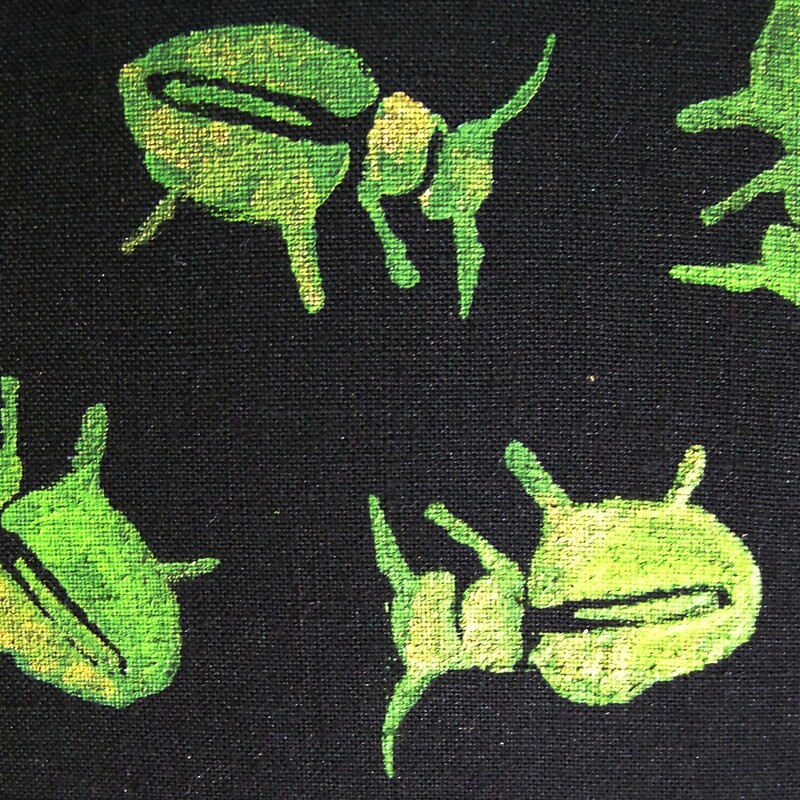 The beetles are each individual arranged in a unique pattern and printed in green with a touch of gold. I like to use these sort of bags when I’m shopping to separate smaller items, such as cotton reels, within my bigger bag. It could also be used to store a notebooks, as a kindle sleeve, a clutch bag or to keep an ipad in (although I haven’t check the size as I don’t own one). It’s unique and individually hand made and printed by myself. To enter comment on this post and include the words “Tansy beetle”. The giveaway ends at midnight (00:00 GMT) on the 26th of April 2011 so only posts before then will be entered. I’ll contact the winner by email so make sure the email address you fill in when you comment is accurate. Only one entry per person and the winner will be chosen randomly from everyone who enters. Yesterday I read some sites about earth day and about doing something to celebrate the day. I decided to use some of the organic fair trade cotton I have to make something and give it away on my blog. As it’s for earth day I took inspiration from my walks by the river this weekend and decided to feature the Tansy beetle which lives along the river. I always find drawing from life interesting, observing how creatures move and their foibles leads me to a more creative picture then if I just drew a standard image. After doing some pencil sketches and looking at the photographs I drew the image I used for the prints. I chose that picture because I thought it looked more dynamic then the others. It takes some consideration to make a sketch suitable for printing as it’s the places where the ink doesn’t appear as much as where does. Once I’d sorted this out I printing the beetles in green with gold highlights. Hopefully I’ll have finished sewing by tomorrow and then I can start my first giveaway. I’m waiting to start my next project, a men’s short sleeved shirt. The planning has been a lot of fun, especially deciding the design details. 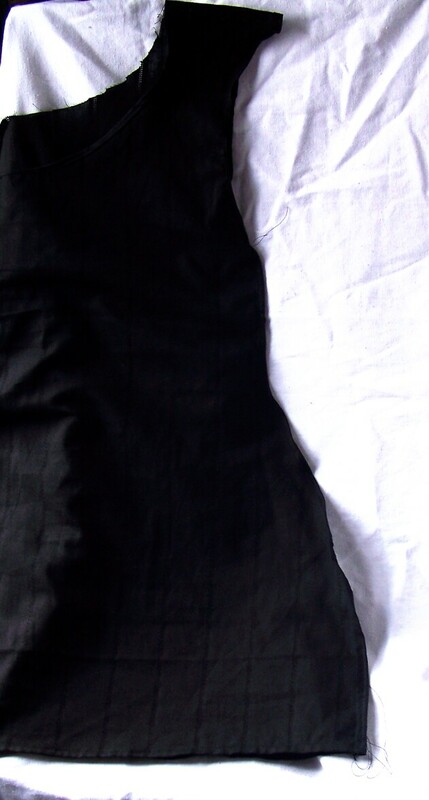 Looking through samples of fair trade and organic cotton gave me a much better feel for the different fabrics available. For this shirt, after talking to the person the shirt’s for, I ordered the green gingham with large checks. The colour is the fabric at the front of the photo above but with the design of the blue fabric behind it. While I’ve been waiting for the fabric to arrive I’ve been working out the details I can add to make the shirt pop. I always think of check shirts as informal and rugged in style, like lumberjack shirts, so I decided to play on this in an understated way by making the stitching more visible. Normally the stitching would be in white thread so that it blends in but to enhance the green of the shirts I’m going to highlight some of the stitching in a coppery/brass/goldy brown colour. I’ve bought two shades of thread for this and I’ll see which one works best. To go with this I also chose metal brassy buttons, I thought these would look good with a design on them as well. I’m lucky that York has a great haberdashery with thousands of buttons to choose from so I took a walk to browse their collection. The ones I picked are shown in the picture and have either a Chinese style dragon or fish which is cool. Unfortunately I’ve completed all the preparation I can so now all I can do is wait with excitement for the fabric to arrive.